The cover label shown at the right is a later label, from 1908. The decision to illustrate a typical model on the box labels was made during the early years of the first decade of the 1900s. The sets with metal parts pushed the decision to make different labels for different sets. It took several years to extend the idea to the main series of all stone sets. Richter was not at all careful about which illustration was on which box. Usually the building illustrated could not be build with that set, but required at least one supplement set. (Not a legal marketing practice today, I think.) However, with honesty in mind, this illustration is can be built with this set (and, of course, the lower numbered sets [a total of five boxes] it supplements). The languages on this set are German, English, French and Dutch. In this case English was aimed at England, and the market served was the "nord", or northern Europe market. French is included for the Belgium, not French market. Today, there are many collectors and builders (This page shows some exhibition quality buildings.) of Anchor Stone Building Sets. A number of them are members of the international Club of Anchor Friends (Club van Ankervrienden), a Dutch club with members from the Netherlands, Germany, Austria, Switzerland, Great Britain and the USA. 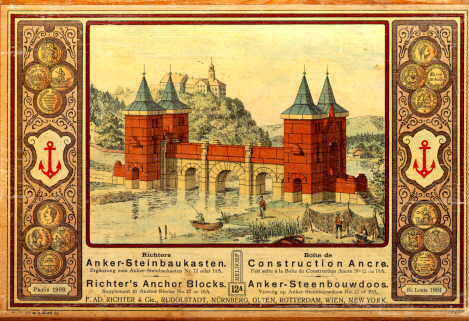 Over 600 different Anchor Stone Building Sets were produced in a number of different series. In addition Richter offered other "stone" products such as puzzles and laying games. Information on these building set series is provided here, but one can e-mail me on other Richter products. People who would like to know more about a specific set, including value, or are only interested in additional general information are urged to contact George Hardy (This page shows some of my buildings.) by e-mail. All e-mail questions will be answered, to the extent of my knowledge. Sets are now being produced again! Their quality is high. I urge people interested in starting Anchor building, and those who want to provide their educational benefits to their children, to consider buying these new sets. Please note that this home page is under constant revision. The graphics are JPEG, which improves quality and reduces file size. I have used the savings from this graphics format to enlarge some pictures and add additional ones. Many new graphics, and additional text, are uploaded once a month, as close to the first as possible. I have decided to change the full set of graphics only once a quarter, as most people do not read beyond the first page. If you only have a little time, I urge you to take a look at the "builders" page. So please plan to drop by monthly to see the new pictures. In the restricted (1.4M) space of my home page, I can provide only a limited view of the wonderful world of Richter's Anchor stones. For the month of March, 1997. Anchor exhibitions being held in the next few months. You are visitor number to the Club of Anchor Friends' home page since the posting date of . From the first appearance of the Anchor home page, August 30, 1996, there has been a slow but steady increase in the number of people accessing it. Over the previous six months there have been about 1,100 visitors, with more than 240 during February. This revision is the eighth one that has been on the net. (My first effort was up only four days, until I learned how to display graphics.) The Date and Time is . I plan to update this site monthly. It was last updated on . Thank you for visiting my "Anchor" web site.